Körös or Hármas Körös River is 455 km long, formed in East-Hungary by the junction of three headstreams that rise in Transylvania, NW Romania. It meanders west through farmland to the Tisza River at Csongrád. The Körös is used for irrigation. 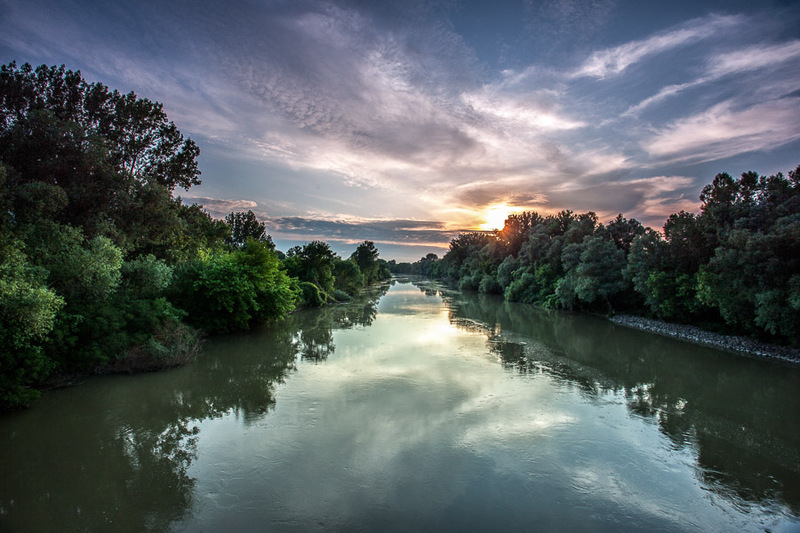 Körös (-Hungarian, Romanian: Criş, German: Kreisch) is the name of a river in eastern Hungary. It is formed at the confluence of the rivers Crişul Alb (Hungarian: Fehér-Körös) and Crişul Negru (Hungarian: Fekete-Körös) near Gyula (Romanian: Ghiula). The Crişul Repede River (Hungarian: Sebes-Körös) flows into the Körös River near Gyoma. All three rivers have their source in the Apuseni Mountains, in Romania. The Körös flows into the Tisza River near Csongrád. The regulation of rivers was finished by the end of the 19th century so the length of the Körös rivers was reduced to 455 km from 1035 km and parallel to this also 6000 km long internal canal was constructed. The regulation reshaped the hydrographic map of the landscape and altered the flora and fauna of the region, as well. 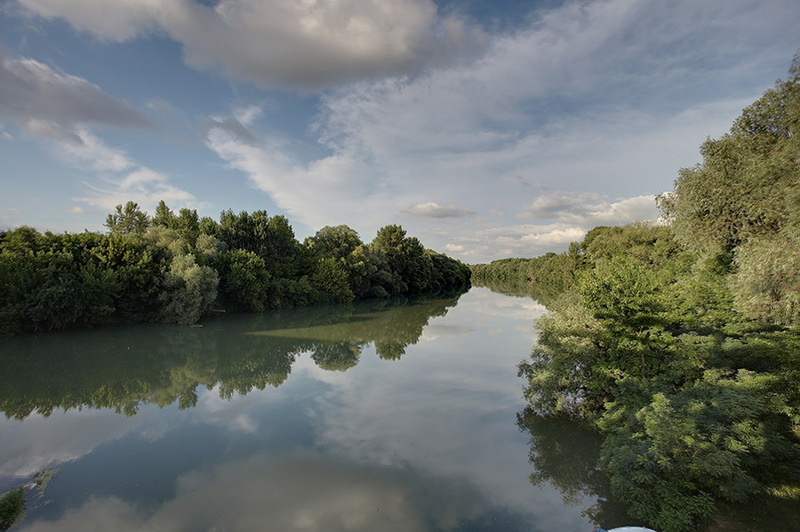 The Hármas-Körös River has the cleanest water in Hungary. Its section next to Gyomaendrőd has a beach where water tourists may take a rest. The river and its flood plain is a natural reserve, part of the Körös-Maros National Park. Gyomaendrőd’s local government created a 26km long nature trail alongside the riverbed in the flood plain to be explored on foot, by bike or on horseback. On the banks of the Körös fishing places are swarming. For the purpose of observing and enjoyable sight three high stands were erected nicely fitting into the landscape. The sight of the landscape underwent a lot of transformation during the past centuries. The present day’s natural scenery was obtained during the time of the river regulations. In the last years of the 19th century (in 1894) the huge landscape shaping, restructuring works were finished cutting back the length of the river from 235 km to 93 km. Before the era of reclamations (draining) and regulations the Körös rivers and the Berettyó River formed a huge marshland where in an undisturbed environment armies of water birds lived in the expansive sedge marshes. The regulations and the draining of swamps placed meadows and plough lands where beforehand reed plots stretched. Due to the water-related propositions the river was channeled in between dikes and during the floods the inundated area became smaller: in the case of the Hármas-Körös River it was 600-800m wide. The floating plants and weeds on water conjure up a bygone water world but not even near with such a variety as an old account proves from 1935 where white spots of water rich in sprits with white water-lily, yellow floating-heart and water-rose are mentioned. This diversity of species now is of the past and there are a lot of protected species from today’s prevalent aquatic plants. The Körös region has exceptional natural properties. Mostly continental weather is predominating but the distribution of precipitation and temperature is extreme. The annual mean temperature is 10-11 Celsius (50-52 Fahrenheit) degree with a very hot summer and 70% average relative humidity. The Average Annual Precipitation is 500mm, in some places less. Typically snowfall is scant and the snow cover lasts only for a short period. The Körös Valley’s distinctive appearance is characterized by the canals, billabongs (dead channels), clay pits, periodically renewing streamlets, high waters, meadows and marshes appearing and disappearing in flood plains. The Hármas-Körös River is running from the confluence of Sebes-Körös and Kettős-Körös till Csongrád in a riverbed squeezed in between dikes then flows into the Tisza River. It is accompanied by innumerous billabongs, oxbow lakes which are originated partly from cutting the meanders of the river. Some of the dead end rivers are to be found in the flood plains while some of them are situated mostly in agricultural lands. It’s the task of natural preservation to secure keeping the habitats - created in the flood plains of Körös rivers in the midst of the cultivated landscape of the Southern Great Plain that during the centuries turned into “flatland culture” – in intact condition. The flood plain stretches of the river have great importance as the Körös Valley was recommended into the ranks of the Europe-wide significant bird habitats. Besides mentioning the hatching bird species it provides resting and nourishment places for the bird species flying through the Carpathians and for the birds temporarily staying here, as well. The old, dry-rotten trees provide excellent pigeon holes for the hollow breeding birds. Hoopoe, woodpecker, blue cap and great titmouse breed here. From the protected plants of the clay pit forests it’s important to mention the summer snowflake and the moon flower. From the birds of prey the hobby, the hawk and the buzzard are the most frequent. The water of the Hármas-Körös River rarely freezes up entirely nor is covered by ice thus providing significant breeding area for the migrating wild ducks in the autumn. Let alone it’s excellent fishing water. The recent years’ researches revealed that we can find 40 species here from the 69 fish species turned up in Hungary.